15 February 2000. Thanks to anonymous for pointing. Source: Hardcopy Abacus, Vol. 5, No. 2, Winter 1988, pp. 10-18, 53. Harold Joseph Highland is Distinguished Teaching Professor Emeritus of the State University of New York and a Fellow of the Irish Computing Society. He is editor-in-chief of Computers & Security, the official journal of IFIP Technical Committee 11. As managing director of CompuLit Inc., he heads the organization's Microcomputer Security Testing Laboratory. He writes regularly for several computer and law journals in England, Germany, Australia, Italy, and the States. He was Fulbright Professor of Computer Science at Helsinki University of Technology and the Medical School of the University of Helsinki in 1970-1971. He is the author of over 200 technical articles and some 30 books several of which have been translated into Japanese, German, French, Dutch, Finnish, and Russian. He received his Ph.D. in 1942 B.C. (before computing) while serving with the USAAF during World War II, and learned computing by a "hands-on-approach" while he was dean of the Graduate Business School at Long Island University in 1958. In the spring of 1985 the British public viewed the first demonstration of eavesdropping on a computer's electromagnetic radiation. BBC's "Tomorrow's World" ran a five-minute demonstration on television. The program showed a long shot of a van parked in front of a building in London and faded to a close-up inside the van where a document was displayed on a television screen. The commentator noted that the van's equipment had to scan numerous terminals and documents inside the building before finding one on the upper floors that was suitable to show on the air. At no time did the program identify the building because it is as well known in England as the U.S. Capitol is in the States. The London building in front of which the van was parked was New Scotland Yard. Anyone can put together a primitive eavesdropping unit for somewhat over $100. 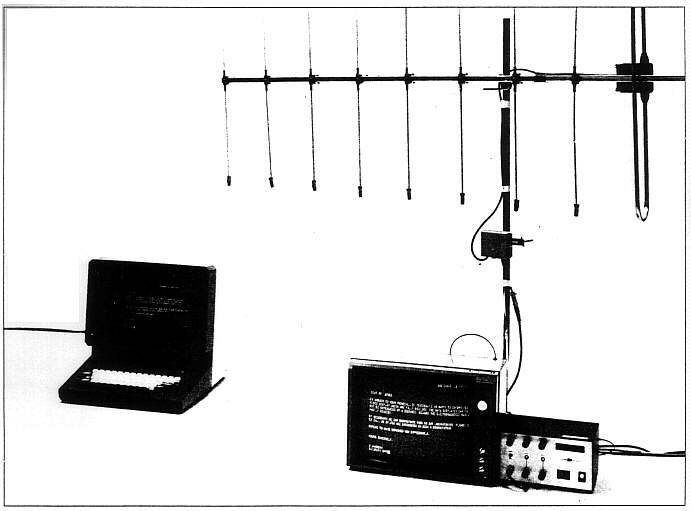 All you need is a portable television set with a voltage-controlled oscillator (VCO) tuner (one with no detents or stops between the channels and no fine tuning control), a dipole antenna with a 75-ohm balum (a balance transformer to match the impedence of the antenna with that of a television set's cable), and a 75-ohm coaxial cable to connect the set to the antenna's balum. The unit will have a limited range, between 20 and 40 feet, and the reception may be poor because the picture will be unsteady. If extensions are used with the vertical and horizontal hold controls for finer tuning, picture quality will improve. With some knowledge of television design and construction, you could built a more efficient unit at higher cost. The circuit diagram of a TV set with a VCO tuner is available in Sams Photofact #2218, a series used by many television repair shops. The current widespread interest and dismay over electromagnetic radiation (EMR) and electromagnetic eavesdropping might suggest that these are now phenomena or at least were recently discovered. Neither is true. For more than twenty years, international military and intelligence agencies have known that all electronic equipment without suitable shielding generates high levels of radio frequency (RF) signals that can be intercepted and reconstituted into intelligible information. The interception and reconstitution of radiated signals, remained a concern basically of the military and intelligence communities until March 1985, when a Dutch engineer, Wim van Eck, demonstrated passive electromagnetic eavesdropping equipment at Securicom '85 in Cannes, France. In his presentation, van Eck explained that one could produce an eavesdropping device capable of reading data from the screens of terminals and monitors easily at low cost. Checking the materials used against a Radio Shack catalog, he reported a cost of about US $75. In addition to his device, a variable oscillator and frequency divider, he used a television set and a tunable antenna, which added about another $150 to his costs. (see Figure 1). Are you sharing confidential data with people who are not particularly close to you? Tempest standards are classified and are provided only a need-to-know basis to organizations involved in producing such equipment. Some information has been leaked to the technical press so that some techniques are known but have not been officially acknowledged. The accompanying diagram illustrates some of the techniques used to protect a VDT and keyboard. A In place of the conventional plastic housing, a metal case is used for both the VDT and the keyboard. The parts of the housing are made so that there is an overlap of metal at each seam and the seams are welded together with no gaps. A braided metal wire ground is secured to an unpainted surface of the metal base. B The main power supply switch, fuse, and electrical RF filter are enclosed in a metal box that is grounded to a paint-free surface. C A flexible EMI gasket is fitted around the face of the CRT to seal the opening when the cover is in place. The CRT anode, the screen. would be metal coated, preferably gold, and the face of the CRT is covered with a metal-coated mesh with an antireflection coating. D An EMI gasket is placed in a groove in the metal base of the unit into which the top housing fits securely. E The keyboard in its metal housing is surrounded by an EMI gasket, and the keys are coated with a metallic vapor or covered with a formed metal-coated film. F A shielded cable connects the keyboard to the VDT. G Any printed circuit boards used within the VDT are encased in a metal cage grounded to the metal base. The more security-sensitive boards are placed away from the outside of the unit. The cable connectors are grounded against the board cage and not the base of the unit. H The high voltage supply needed by the CRT is shielded in a metal unit and grounded to the base unit. I Ventilation is provided by louvered slits in the top or back of the unit with an EMI underscreen or special honeycomb unit. What startled the audience at the conference was the device's ability to read visual display terminal (VDT) data from outside a building. Wan Eck noted that with slightly more sophisticated and expensive equipment, it was possible to intercept data from a VDT screen up to l kilometer away. Several hundred computer security specialists, mostly from Europe, attended Securicom '85. French law prohibits public discussions of electromagnetic radiation eavesdropping. As a result, the conference director decided to have no French citizen involved with the van Eck presentation: I chaired the session. During the question-and-answer period following van Eck's presentation, an attendee told the audience that only a few months earlier, in October 1984, the West German police had apprehended a Polish spy. The police found among his papers a list of excellent locations for using electronic eavesdropping equipment to obtain information from various government and industry computers. The European press at the conference interviewed Wim van Eck and me extensively. Within a week over 700) articles appeared in newspapers all over Europe. Lost in the stories about the "Van Eck phenomenon" were the reasons Wim van Eck undertook his project. The Dutch PTT (Post, Telephone, and Telegraph, operates both the telephone service and mail delivery and prefers to transmit mail electronically instead of physically, so it has tested monitors and keyboards connected to telephone lines in homes for sending and receiving mail. During the tests the Dutch PTT found that some users complained about interference from their neighbor's units. Several persons were able to read a neighbor's mail as the neighbor viewed electronic mail on the screen at home. Van Eck's section in the PTT was assigned the task of developing an inexpensive detection unit to monitor RF electromagnetic radiation. This unit would be used to evaluate monitors for the home and could be used in the field to help with installation problems. A few articles were published in the U.S. but many computer professionals, security specialists, and business people are still unaware of the danger of electro magnetic eavesdropping and the countermeasures that can be taken. The U.S. government appears willing to go to embarrassing lengths to keep an open discussion and demonstration of electronic eavesdropping equipment from the public -- even the technical and professional personnel not directly involved in its countermeasure program. The Tempest (Transient ElectroMagnetic Pulse Emanation STandard) project is a joint research and development effort of the U.S. National Security Agency (NSA) and the Department of Defense (DoD) and has been classified for about 20 years. Even the program's name was classified and unmentionable until only a few years ago. Tempest refers to the investigation and study of potentially compromising electronic signals emitted by computers and other electronic devices. It also involves the development of countermeasures, particularly the shielding of computers and related devices so that the emanations cannot be collected, analyzed, and understood. A national Tempest policy was embodied in the National Communications Security Committee Directive 4, "National Policy on Control of Compromising Emanations, issued in January 1981. It instructed all federal agencies to protect classified information against compromising emanations. The procedures to use in determining the countermeasures needed for equipment and facilities were specified in the National Communications Security Instruction 5004, which was issued in January 1984 and classified as secret. Production and testing of NSA's Tempest-shielded equipment is big business. About 175 companies are authorized to produce or test Tempest-shielded equipment. 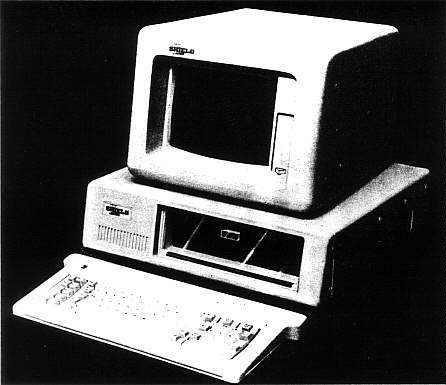 Frost & Sullivan, a New York research company, predicts that sales of Tempest security systems and services will rise from $874 million in 1986 to $2.9 billion in 1992. Most of these sales will be made to the intelligence community, the military, law-enforcement agencies, and some civilian federal government agencies. The survey notes the important role that NSA is playing in the promotion of Tempest technology and the growth in classified military research created by larger defense budgets. In the United States neither NSA nor DoD has been willing to provide any information to the national press, or even the technical press. In fact, open discussion of this topic has been barred at professional meetings. At the annual computer security conference and exhibition of the Computer Security Institute (CSI), a private organization, in November 1986, government intervention was evident. In one case an exhibitor interested in demonstrating the effectiveness of his product against electromagnetic eavesdropping withdrew before the conference opened. In another case, Wang Research Laboratories (Wang is the largest producer of Tempest equipment) had agreed to give a demonstration of eavesdropping equipment to computer security specialists. NSA stepped in and formally classified the speech the Wang speakers had intended to make. At the Interface '87 conference, a major Washington, DC, company canceled its seminar, "How Computer Security Can Be Compromised," a demonstration of passive eavesdropping techniques, at the request of the NSA. The Swedish government's approach to the problem is different. The danger of electromagnetic eavesdropping was exposed by a Swedish technical weekly late in 1982. By early 1983 National Police Board specialists began informing security specialists and directors in the business community about radiant signals (ROS in its abbreviated form in Swedish), including superimposed signals in power networks and acoustical signals. 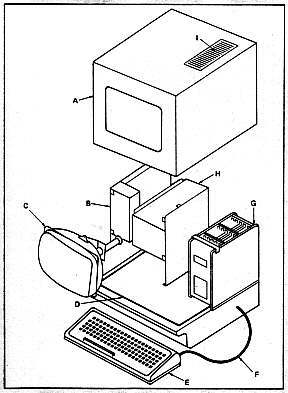 In 1984 the Swedish Government Commission on the Vulnerability of EDP Equipment and the National Council for Crime Prevention jointly issued an 18-page booklet entitled Läckande Datorer ("leaking computers")[See reference]. The booklet provides information about the problem and includes instructions regarding countermeasures aside from Tempest-shielded equipment. A table indicates how, in principle, five types of measures protect or do not protect against four types of radiant signals. The booklet became a best-seller in the business community and is still in print. V-RR or video signal radiation, the area in which van Eck worked . R-RR or radio component radiation, all the remaining signal frequency radiation generated by computer equipment and networks as a side effect of internal currents and voltage leakage. L-RR or electrical line radiation, the direct electrical effect on other legitimate currents, primarily the power modulation of the electrical lines even at the electrical outlets. Anyone with some knowledge of elementary physics is aware that electricity flowing through a wire propagates an electromagnetic wave (see Figure 2). Electromagnetic interference (EMI) is any form of electrical disturbance, signal, or noise, a common phenomenon that crosses all electric and electronic disciplines. EMI problems appear in all degrees, from a nuisance to catastrophic accidents. Figure 2. 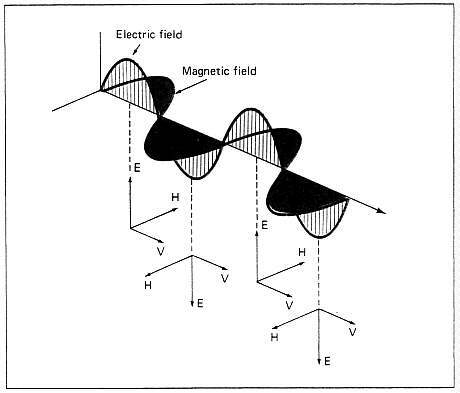 Electricity flowing through a wire or any electronic component propagates an electromagnetic wave with two vectors, the electric vector, E, and the magnetic vector, H. V is the direction of wave travel. These waves are generated by the components and printed circuits within a VDT and/or a microcomputer. Relative radiation levels of some of the popular logic families include a 0.1 mA current in a CMOS (complementary metal oxide silicon) with a bandwidth of 3 MHz to a 30 mA current in an S-TTL (transistor to transistor logic) with a bandwidth of 120 MHz. In one instance, radio-controlled automatic garage doors mysteriously failed to work in one part of the U.S., but only on certain days. After some electronic sleuthing, it was found that the scrambled communications signals transmitted by satellite to the President's E4-B command plane parked at March Air Force Base interfered with the garage-door opener signals in the area. In another instance, an operator using a handheld radio for in-plant communications caused a ladle of molten steel moving along an overhead crane to tip and splash nearby workers. He was about 15 feet away from the drop cable with its six-pushbutton control box that was used to control the crane's movement and operation. Computer dinosaurs like myself remember the early days in computing when terminals were introduced. We found that a terminal in one room interfered with another terminal along the same wall in the next room. In one instance in a hospital we found that screens were wiped clean when a fluoroscope two floors above was used. The Federal Communications Commission (FCC) has attempted to control the EMI problem in order to eliminate interference with radio and television reception. Only a few years ago, people who lived near operators of ham equipment found interference with their TV and even radio reception. Some still do. In 1984 the FCC started to require microcomputer manufacturers to make certain that the units did not interfere with radio-television frequencies. Micros must be certified as noninterfering before they can sold. Despite this precaution, the FCC received about 1,000 complaints last year where interference was traced to microcomputers. Every component of a computer -- the power supply, microprocessor chips, connecting cables, video display unit, printers, keyboards, etc. -- radiates RF signals. In designing his eavesdropping device, van Eck attacked the most vulnerable unit, the terminal or monitor, the visual display terminal. A VDT radiates a field with two distinguishable parts:  narrowband harmonies of the digital clock signals, and  broadband harmonies of the various random digital signals, such as the video signal. Unlike other broadband signals inside the VDT, the video signal is amplified before it is fed into the cathode ray tube (CRT). 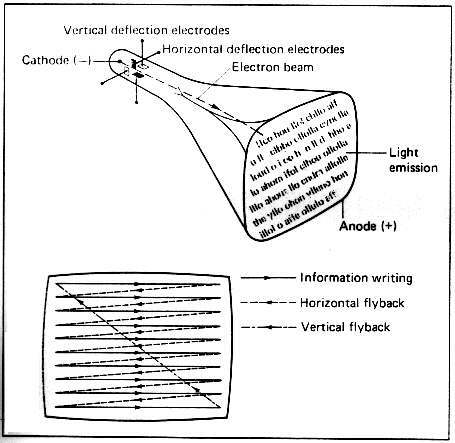 The screen image is built by means of an electron beam in a cathode ray tube (see Figure 3). When a high voltage is applied between a heated electrode (negatively charged cathode) and the conductive layer on the inside of the screen (positively charged anode), electrons start flowing from the cathode to anode. The signal required to modulate the light intensity of the moving spot on the screen is called the video signal. Figure 3. Most easily captured by the van Eck type eavesdropping equipment are the waves generated by the electrons bombarding the CRT's anode faceplace. The CRT acts as a miniature television transmitter emitting signals in the UHF range. The picture on the screen is built up sequentially. Each picture consists of a number of horizontal lines with the first line at the top and the last line at the bottom. The screen is refreshed by the electron beam projected within the CRT, which, when finished with the last line, returns to the start of the top line and repeats its writing on the screen. The acceleration of electric charges results in the generation of an electromagnetic field. The electromagnetic spectrum is shown in Figure 4. VDTs are designed to produce visible radiation. but in the process they produce other types of electromagnetic radiation as well. Hard X rays, gamma rays, and microwaves are not emitted by VDTs, but soft X rays, ultraviolet, visible, and infrared light, and various radio frequencies are emitted along with pulsated radiation, very low frequency (VLF) waves, and extremely low frequency (ELF) waves. The electromagnetic radiation emitted hy a VDT that is easiest to capture is in the television frequency range. The frequency at which a VDT radiates is almost as unique as a fingerprint. Two identical models from the same VDT manufacturer usually emit signals at slightly different frequencies so that a sensitive intercept unit can discriminate between them. In addition, because of power differences between VDTs in the U.S. and Europe, emissions are in a different frequency range. Most U.S. units emit a strong UHF signal between 70 and 94 MHz. The distance of the VDT from the eavesdropping unit is not the only determinant of whether or not the signals can be captured and reconstituted. A strong local TV broadcast signal can mask the VDT signal. Moving the TV receiver to another nearby location, where the local TV station is weaker, could make picking up the VDT's signal easier. The equipment used by van Eck for his research consists of three components: a dipole antenna, a TV receiver, and a special custom-built synchronization unit. The eavesdropping unit takes advantage of the fact that every unshielded VDT radiates its video signal and related harmonics as RF signals as if it were a miniature TV station. The image on the VDT screen is built up sequentially with a number of horizontal lines so close together that the individual lines cannot be recognized by a viewer looking at the screen from a reasonable distance. The signal received from the VDT by the TV receiver of the eavesdropping unit does not contain synchronization information. The picture displayed on the screen while it is receiving radiation from the computer's VDT moves over the screen in both vertical and horizontal directions, unless the synchronization frequencies in the VDT and the detection receiver are the same. Although the synchronization frequencies are often the same, the picture received on the detection unit's TV will not be very stable and not easily readable. The quality of reception can be improved by externally generating the necessary synchronization signals and feeding them into the detection TV unit. an adjustable oscillator for the frequency range 40-80 Hz to generate the vertical synchronization signal or picture synchronization. Both signals are combined and fed into the synchronization separator of the detection unit's TV receiver. To keep electromagnetic interference to a minimum, the SRU is connected to the TV receiver with a 75-ohm coaxial cable. The problem of constantly adjusting both the horizontal and vertical oscillators simultaneously during reception can be solved in one of two ways. where k is equal to the number of display lines on the screen. Therefore, it is practical to generate only the horizontal synchronization frequency and obtain the vertical synchronization frequency by using a programmable digital frequency divider to adjust for k (the divider costs as little as $10). Once the number of lines on the screen has been determined, the two synchronization signals can be set by adjusting only a single oscillator. The second way makes adjustment easier but is more costly. This involves using a combined horizontal and vertical synchronization oscillator similar to those used by TV stations to control their broadcast signal. Some details about TV broadcasting help explain the fine tuning needed by an eavesdropping unit. Television stations are allocated a frequency band of 6 MHz, and are required to transmit the video and audio signals at specific frequencies within that band. 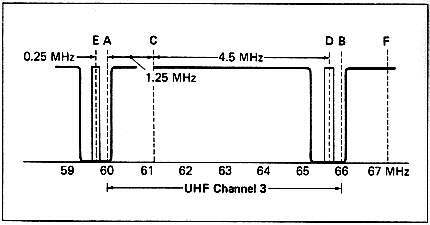 For example, a station broadcasting as channel 3 in the ultra high frequency (UHF) range is assigned a band from 60 to 66 MHz (see the accompanying illustration). Its video signal is transmitted at 61.25 MHz and audio signal at 65.75 MHz. Similarly, channel 21 in the very high frequency (VHF) range has a band between 512 and 518 MHz, and transmits its video signal at 519.25 MHz and audio signal at 523.75 MHz. In the accompanying illustration, A and B define the limits of channel 3. The video signal, C, and the audio signal, D, are at the prescribed frequencies at which channel 3 is authorized to operate. The conventional UHF tuner (channels 2 through 13) has two control knobs, one for channel selection and the other for fine tuning. The channel selector has a detent, a mechanical means of holding the selector precisely at the desired position of the channel-selecting contacts. Most detents consist of a spring-loaded roller or steel ball that slips into an indented notch in the channel selector. The tuner's circuitry is preset for each channel's video and audio signals. A channel's preset video and audio signals may not be at their assigned positions. Signal deflection from buildings, atmospheric conditions, and even shifts caused by the station's broadcast equipment can cause a picture to lose its sharpness and appear blurred and the sound distorted. Channel 3 signal drift can create interference with the channel 2 audio signal, E, or the channel 4 video signal, F (see illustration). The fine-tuning knob can correct these difficulties, but the fine-tuning range is often insufficient to cover the 6 MHz assigned to the channel. Sections of the broadcast frequency band therefore remain as blind spots where the receiving unit cannot locate the broadcast signal. Because of this, the eavesdropping unit requires a voltage-controlled oscillator (VCO) tuner that has no preset video and audio signal circuits. If a conventional UHF tuner is used however, its input video and audio circuitry must be bypassed and an external VCO substituted. A microcomputer has two prime sources of video signals. One is a chip within the microcomputer. The HD6845P in an XT, for example, is similar to a radio frequency modulator and emits a signal at the channel 3 or 4 frequency. To comply with FCC regulations, this chip's signals are attenuated. If there is insufficient attenuation of this signal, however, a portable television set with a VCO tuner can pick up this signal up to some 10 feet away. Such a television set in an adjoining office can be used to eavesdrop on a "noisy" microcomputer. The other source is the CRT of the terminal or monitor. This signal is not confined to a preset frequency but is within the lower UHF range. The eavesdropping unit must have a continuous signal selector. The vertical and horizontal hold controls for the CRT's video signal are the most critical elements of the synchronization component of the eavesdropping unit. In developing a computer security program, an organization goes through the procedure of risk assessment. This should include consideration of the danger from electromagnetic eavesdropping. Each organization will have to determine how sensitive its data is and the probability that it would be stolen by passive eavesdropping. Will it be worthwhile for a competitor to read the firm's marketing plans or its progress in research and development? A company specializing in mergers and takeovers is certainly a prime target. Passive electromagnetic radiation eavesdropping is not yet a violation of law. One way to obtain total protection against electromagnetic eavesdropping is to place all VDTs and microcomputers in a specially prepared interior room. This would require turning the room into a Faraday cage by lining all the walls, ceiling, and floor with interconnected wire mesh or foil so that there were no openings at any joints. This covering would have to be firmly grounded. Specially designed passageways to enter or leave this area would have to be added. In addition, RF filters would have to be on the electrical and telephone lines, and all heating vents would have to be specially protected. No water pipes could be in the room. Shielded telephone instruments would have to be a minimum of 6 feet away from any computer equipment. Naturally no ordinary business firm could operate in such an environment. Another way would be to build a Faraday cage around each VDT and have the employee sitting inside. Few people would wish to work in such a cell. More reasonable countermeasures can be used against terminal and or monitor eavesdropping, including attenuation of the transmitted signal white-noise emitters, and random line switching. Attenuating the signal is the Tempest approach. Standard VDTs, microcomputers, and peripherals can be used with special protective coverings, such as the DataProtek SHIELD (see Figure 5) in conjunction with several other measures noted later. The SHIELD itself is a form-fitting unit, easily installed and considerably less expensive than Tempest equipment. Figure 5. DataProtek's SHIELD is designed to reduce the radiation emitted by microcomputer equipment and VDTs and reduces such RF emissions by about 99%. When used with a microcomputer, it covers the monitor, CPU, and keyboard with individual vacuum-formed cases of flame-retardant, metal-coated plastic. A VDT and the keyboard are encased in the same material. The form-fitting covers contain emission-controlling elements but do not interfere with normal operation. A window of antiglare glass with filtering elements reduces both radiation and glare for greater operator comfort. The SHIELD is easy to install and matches the original equipment in appearance and color. Additional features include filtered air ports, shielded cables for connecting the keyboard to the microcomputer or terminal, ventilating fans, and keyboard fascia of screen-printed metal alloy foil. White-noise emitters are small units placed near the VDT that set up RF interference. Some emitters interfere with the operation of the VDT or microcomputer. However, even if they do not, the ease with which their signals can be separated from the VDT's emanations limits their use to protection against only the most primitive eavesdropping devices. Random line switching is a method of changing the way data is written to the screen by frequent changes of the signal patterns as compared with the standard procedure shown in Figure 3. To provide for random line switching, the video drive circuits in the original equipment must be replaced. This technique often produces and/or increases screen flicker. Because of the low permutation capability of such switchers. the signals can be attacked by a more sophisticated eavesdropper and are not very effective. Regardless of which protection method is used, the following supplementary countermeasures should be added. 1. All electrical power lines should be filtered to prevent RF emissions from the equipment being transmitted along the lines that act as antennas. This is necessary even with Tempest equipment or a product like the SHIELD. 2. If a modem is used, an internal one in a protected microcomputer is secure. An external modem should be protected by a nickel-coated fabric (graphite or aramid filament yarn or polyester thread). 3. Shielded cables should be used between the CPU and the monitor as well as between the CPU and the keyboard. Similarly, a shielded cable should be used between the VDT and its connector. 4. Monochrome monitors and VDTs should be used instead of color ones because their level of RF emissions is generally lower. 5. All units should be securely grounded not only through the normal electrical ground but also by using a braided wire to a building ground. If the VDT is not protected but some protection against eavesdropping is desired, the following precautions can be added to the list above. 1. No VDT should be placed within 50 feet from a window or outside wall of a building. Preferably VDTs should be in an interior room without windows. Neither situation is very practical in a normal business environment. 2. An unprotected VDT should be at least 6 feet from a telephone line. 3. VDTs should be placed at least 6 feet from any water pipes or heating ducts. This is essential for unprotected VDTs because the pipes and ducts act as antennas to amplify RF emissions. In December 1985, Computers & Security, the official journal of the International Federation of Information Processing (IFIP) Technical Committee on Security and Protection in Information Processing Systems, of which I am editor, ran an article by van Eck. The article included a technical appendix describing the basic principles used to construct his inexpensive detection unit. After the publication of van Eck's article, I received telephone calls and letters from individuals who wanted to build their own versions of the van Eck unit. These people were security specialists with military units who were responsible for Tempest security at their posts, technicians with federal law-enforcement agencies, computer security specialists, and technical staffs from companies interested in producing countermeasure products. We did not send circuit diagrams and component lists for the synchronization recovery unit or the procedure to interface that unit with a television receiver because of a prior agreement with Wim van Eck. We sent a copy of the van Eck article, and I did provide answers to technical questions from those who had television engineering and communications backgrounds. As of early fall 1987, several individuals have produced equipment similar to that developed by van Eck. The units have been built for special-purpose use and not for sale to the public. A variety of antennas were used, but the best results were obtained with a dipole antenna designed for 30-1000 MHz reception with a bandwidth of at least 4 MHz. Good results were also obtained with a 30-300 MHz biconical antenna. Several who were successful in building an eavesdropping unit noted that they were helped in their design and construction by articles about pay-TV decoders that appeared in the electronics press several years ago. It is probably only a matter of time before the detailed circuitry for a van Eck type of device is printed in an electronics or hobby magazine.